Hi my name is Caitlyn and I enjoy reading realistic and historical fiction. These genres are two that I turn to a lot when trying to find a good book. 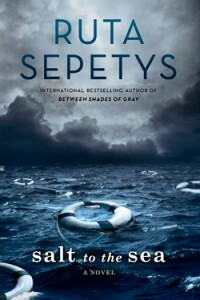 Speaking about good books, one that was recently suggested to me is Salt to the Sea by Ruta Sepetys. This was suggested by a friend who is also reading one of her books. Salt to the Sea is about four teenagers trying to escape WWII. Instead of the author focusing on who the Germans are against, it focuses on who he RUSSIANS are against. The author switches point of views of characters in each chapter between a German Deserter, a Polish girl, a Lithuanian nurse, and another German soldier. The book really shows the struggles for kids in such a scary time. The characters are very well developed and are looked at as adults when in reality they are each under 22. The plot can really captivate the reader and defiantly make you want to read more. Ruta Sepetys has a really unique style that I would like to point out. She is able to switch characters' perspectives while keeping the story moving. She is also able to describe characters be using another one's perspective so you are able to find out more about that character. Through out the book you will always know something another character doesn't. Salt to the Sea is a book I suggest putting on your book list and will let you know more about.